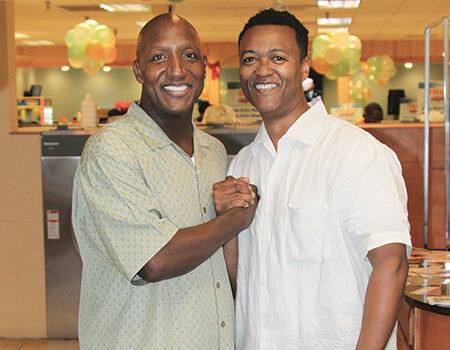 Owners Tyrone Akins (left) and Brian Holland run their stores with a community focus, providing various amenities and programs for locals. Both locations offer up an equipment mix of approximately 140 Huebsch-brand washers and dryers in various capacities. 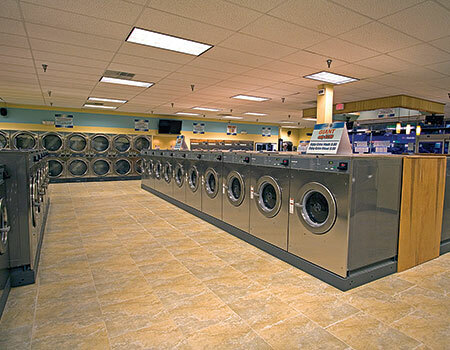 Located about 8 miles apart, the laundries feature a vast array of services and amenities: wash-dry-fold, drop-off dry cleaning, massage chairs, low-fee computer rentals, free Wi-Fi, video games, Starbucks coffee kiosks, digital jukeboxes, flat-screen TVs and a mix of approximately 140 Huebsch washers and dryers in 20- to 80-pound capacities. Fully attended, open 24 hours per day and card-operated, The Laundry Cafés not only offer a haven for inner-city residents to complete laundry, they deliver customer care and community support services. Attendants greet customers with curbside assistance, and once indoors, take them through the benefits of the laundry’s wireless ESD CyberLaundry System. Rather than using quarters to operate equipment, customers swipe loyalty cards, debit cards and credit cards, according to Holland. The CyberLaundry System is customizable so laundries can accept any combination of coins, loyalty cards, debit cards and credit cards. In this case, Akins and Holland decided to go with cards only. Holland touts the system’s management controls, tracking tools and remote access, which he values as the laundries are open 24/7. 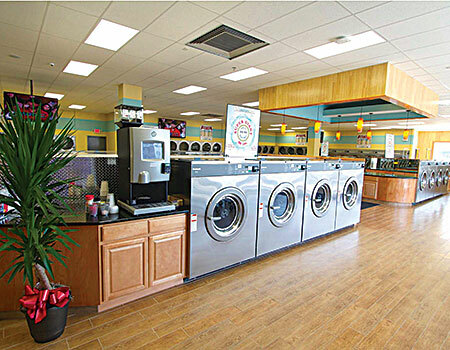 More than 90% of their customers use The Laundry Café loyalty cards to operate washers and dryers, and gain access to the facilities’ bathrooms, adds Holland. Customers access Value Transfer Machines (VTM), which are located throughout the laundries, to load value onto their cards. For every wash, customers are rewarded with points toward a free dry. For travelers and passersby who choose to not have a loyalty card, CyberLaundry allows them to use a credit card right at the washer. The CyberLaundry System’s digital interface can be installed on equipment from all major manufacturers, according to Holland, who praises the operator controls that the system provides to help run his business. At any time, he can run promotions through the CyberLaundry System, replace or add value to a loyalty card, or view a customer’s transactional history from any computer with Internet access. While the CyberLaundry System provides various end-user benefits to laundry customers, it also helps Akins and Holland manage their business. The CyberLaundry system comes with a management tool, MyLaundryLink, which allows them to access data about their laundries, in real time, via the Internet. Even when away from their stores, Akins and Holland can monitor and interact with every washer and dryer in each location. “We’ve got two stores and we can’t be [at] two places at once. It allows us to manage critical business processes without having to be physically present,” says Akins. This feature can be utilized in various scenarios when Akins and Holland are unavailable at their stores. For example, when an attendant needs to start a washer to process wash-dry-fold. “We can easily start washers from our computers within seconds, allowing for an uninterrupted flow to this task,” says Akins. Additionally, they can monitor washer/dryer turns per day, customer accounts, and income by hour, day, month and year. MyLaundryLink also assists with payroll by tracking employee hours and pay rates, according to Akins. Check back Wednesday for the conclusion!